The Philomele greek theater mask was created for Love of the Nightingale by Timeberlake Wertenbaker. It is a beautiful bird mask with a stunning expressive range. Philomele, the sister of Procne, is raped by Tereus, husband to Procne. Having had her tongue cut out to keep from telling, she acts out the event for Procne with large dolls she has created. The gods turn her into a Swallow to help her escape the wrath of Tereus. 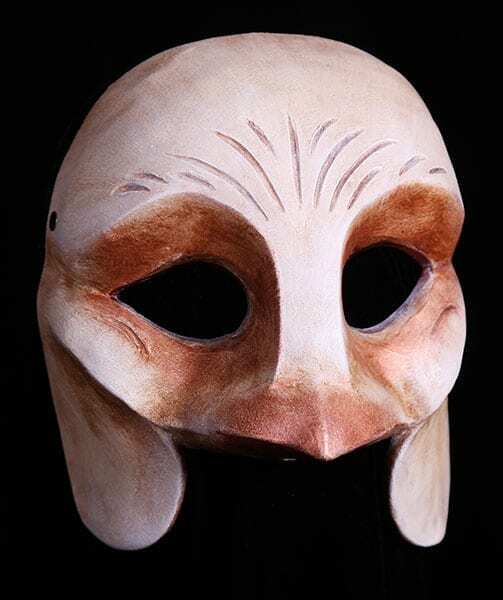 This beautiful bird half mask is appropriate for many styles of theatre. It has an amazing expressive range.